Cut sheet of puff pastry into 1-2 cm strips, depending on how you would like your mummies to look. 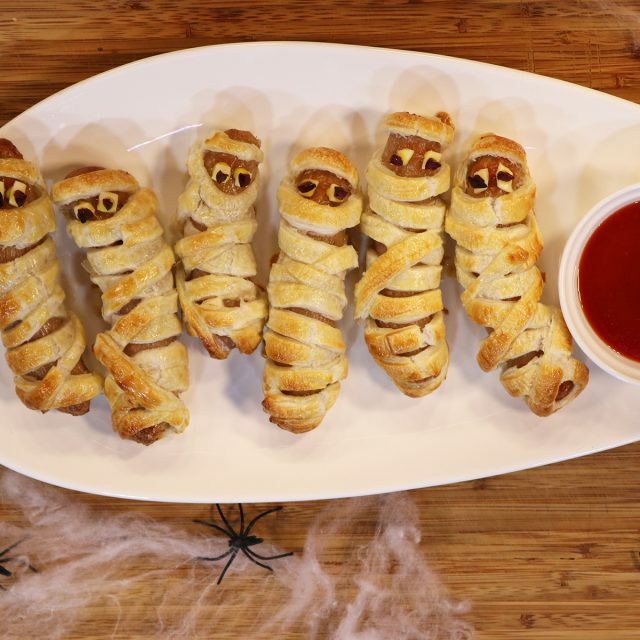 Wrap your pieces of pastry around your sausages, varying the direction of the pastry to create the full mummy effect. Remember to leave a small gap for the eyes. Brush the surface of the of each pork sausage mummy with the beaten egg. Bake the pork sausage mummies in the pre-heated oven for 15 minutes until the mummies are puffed and golden. To create the eyes for your mummy sausages, cut small circles out of your slice of cheese using a small sharp knife. These will form the base of your eyes. For the pupils of the eyes, cut out small sections of your olive slices. Secure cheese base and olive pupils with a drop of mustard. For a delicious difference, wrap the sausages in salami, bacon or prosciutto or sprinkle with grated cheese prior to rolling in the pastry.